Here is the scene after a road trip to Nana's house - sitting in the hallway sifting through a box of books. It was a chapter book that pulled us through a 3rd world hospital visit. 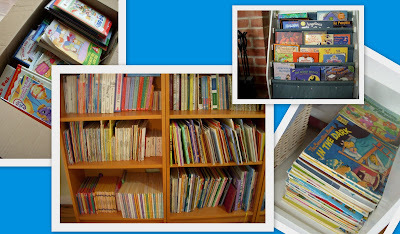 It's the box of used books sent over from Grandpa that formed our library - where selections are made every day for storytimes. However they are displayed, wherever they go - they save our sanity. Recently I learned that Disney launched a virtual library of 500 books. So what do I do now, move a PC into the library nook? Interesting times, that's for sure. If they made that library downloadable from the iPhone? Well, now we've got something! New chapters are waiting at Photo Friday - click over and enjoy! We love books when we are travelling too. I try to find ones that are specific to our destination, to help the children engage with what we are seeing. Our trip to Switzerland this summer was really enhanced by reading Heidi. I'm starting to see some chapter books available on the kindle (e.g. the Magic Tree House), so with the iPhone Kindle reader you'd be there already! I read books on my iPod Touch using Kindle and Stanza, for the convenience of always having it with me. For kids, however, I still like to see them surrounded by paper books, turning the pages, perusing the pictures and words and holding an actual book in their hand. Besides, it's much easier to share a story when there's an actual book to be held. Our home and our car are filled with books. Sometimes it seems that there are too many of them, but then I remind myself that too many books isn't a possibility! I love how neat that library nook is. Ours is kind of a wreck. I went to a presentation on the Disney books, and it is an online application, so as long as you have access to the internet, you can have access to the Disney library. I asked about a Kindle or downloadable format, but that's not in the works at the moment. call me old fashion, but when it comes to books I prefer the traditional paper format. 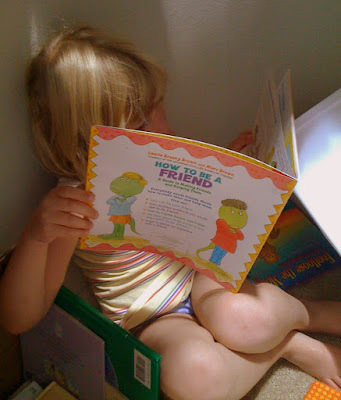 We also take them everywhere, books are the best form of entertainement and a great way to interact with your kids. I suppose electronic books can be convenient, but for pure pleasure reading, there still isn't anything like a real book. If I were traveling for long periods of time, it might be nice to have a whole library of books loaded onto a reader. But, I'm not ready to take a Kindle or a computer out to my hammock, or even to drag it into my family room. Meanwhile, we've got books -everywhere- in this house...and I do mean -everywhere-!